Vermont weddings are a dream for photographers, especially for Wedding Photographers in Burlington. As one of the prominent wedding photographers in Burlington, I make sure to capture every breath-taking Vermont scene and every special moment of the wedding celebration. 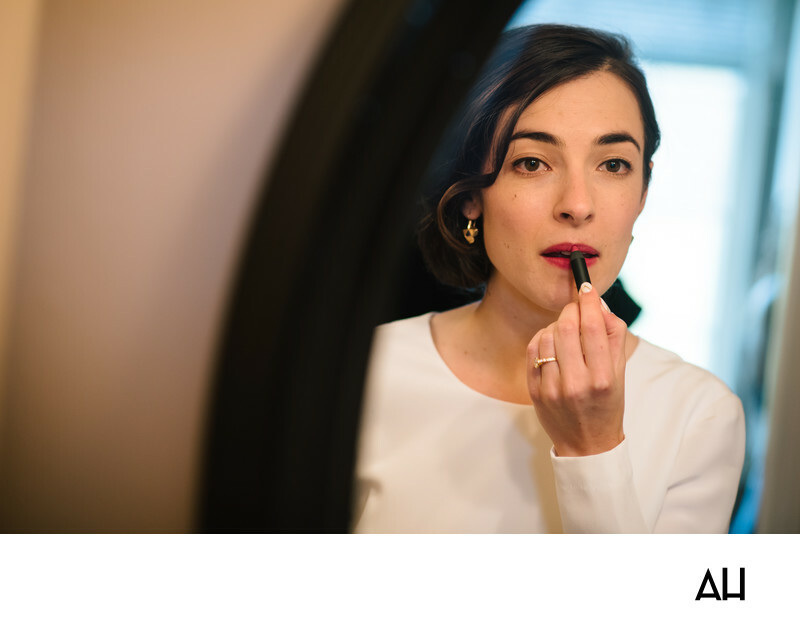 In this image, the bride is carefully applying her lipstick as she prepares for the wedding ceremony. The bride’s gown is ivory and modest, with long sleeves and a high neck. The simple elegance of the dress is accented by the dark hair and eyes of the bride, and the deep red lipstick she applies. The bride keeps her makeup natural, adding touches that highlight the natural beauty of her features. She also did her makeup herself, making the morning her own, and more private experience. The bride added a bit of eyeliner and mascara to her chocolate brown eyes, a bit of blush on her cheeks, and the red lipstick for some flare. Her jewelry is delicate and classically chic. Gold drops hang from her ears and stand out against the bride’s dark brown hair. On the ring finger of her left hand, her engagement ring sits gracefully. A pure symbol of the love and devotion between this woman and her soon-to-be husband. In this moment the bride is poised, moving through the process of getting ready for her wedding day in a calm, meditative state. She breathes in deeply and each time she exhales, a small smile plays on her lips, as she thinks about the day ahead of her, and of all the moments she will soon share with the groom as a married couple.